Your business in front of 19,335 households! in YOUR backyard for pennies. Reach 19,335 (9,851 Grosse Pointe South Area , 9,484 Grosse Pointe North Area) homes in YOUR backyard ! The “Great Big Card” is a gigantic advertising medium, 9” x 12” making it the largest item the US Post Office will deliver without folding and is printed in full color on heavy card stock making stand out amongst everything else in the mail. It will be touched and seen by every household in your market area. How do we know this? It is HUGE and the fact that it is 9” x 12” printed on 14 weight paper double Ultra Violet Coating. It is not folded. 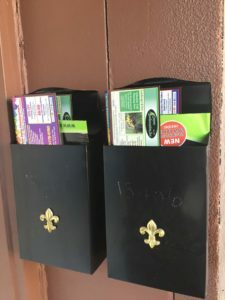 It will hold its shape and other pieces of mail will slide right off when placed through the mail slot or put on the mail table after being delivered by the postal carrier. 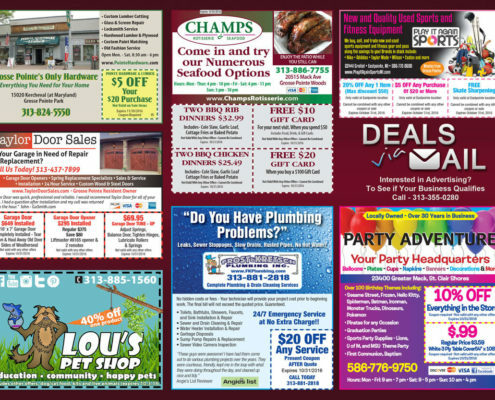 Our flagship product, the great big card connects local businesses with the customers in their target markets with a high quality, low cost direct mail advertisement. 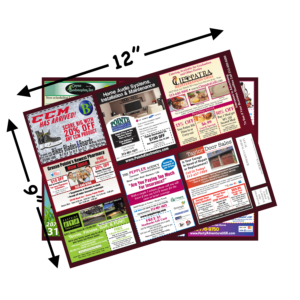 Our flagship product, the great big card connects local businesses with the customers in their target markets with a high quality, low cost direct mail advertisement. Perfect for small businesses, service providers, professionals and anyone looking to introduce themselves to a local community. Reach over 20,000 homes in YOUR backyard ! The Deals Via Mail Billboard will be delivered by the US Post Office to the mailboxes of 20,000+ homes in your backyard. 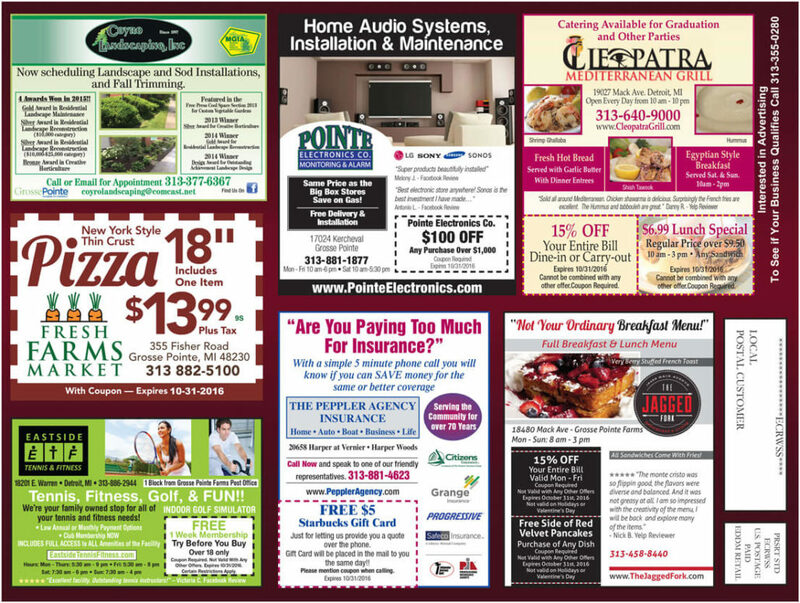 You are not relying on the homeowner opening an envelope, or turning to a certain page in a newspaper to see your ad. It is right in front of them when they get their mail. Everyone reads their mail. By grouping together a number of local small businesses we are able to drastically reduce the cost. We are a family owned business without overhead and salesman commissions to pay. The cost savings are passed on to you.! The Billboard is 9 inches by 12 inches. It will be the largest piece of mail delivered to the house. Look how it TRUMPS everything else. None of your direct competitors will be on the Billboard. There will only be 1 pizza ad, 1 burger ad, 1 dry cleaners ad, etc. You will not have to “one-up” your competition. You are not required to sign any long term contracts or commit to future mailings.! I was initially leery of advertising on the postcard because I had never heard of the company, I did not know if they were legit. 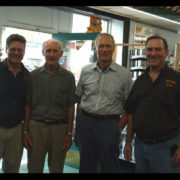 After meeting Bill to discuss the postcard, his professionalism and knowledge made the decision easier to give it a shot. In addition, the price was very reasonable, so it was worth the risk to try it. I was pleased with the return I got. People brought them in right away. The best part is that this goes directly to the customers who are nearest to my business – who also happen to be my best customers. Anytime I can keep them from going to Lowes, Home Depot, or any other hardware store is money well spent. 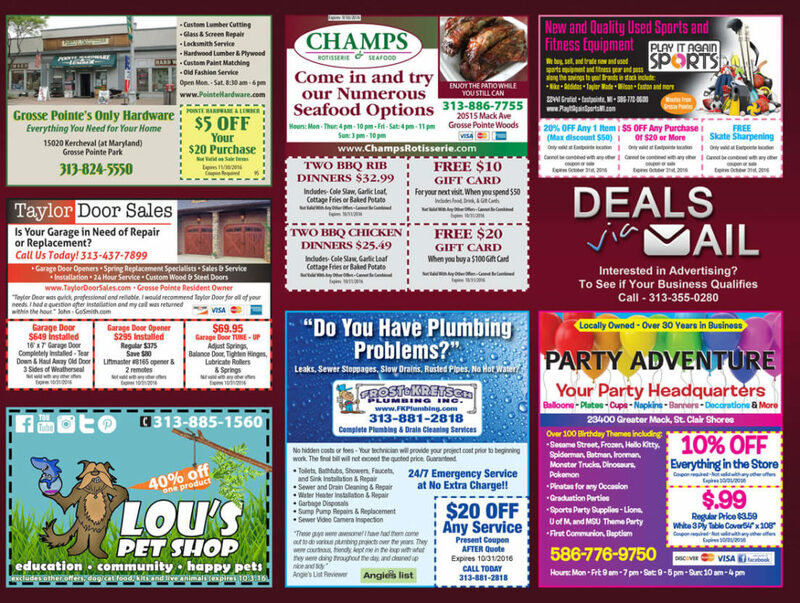 Any business owner has customers who live in their immediate area would be silly not to advertise on this card. I receive so many different solicitations for advertising, there are just so many options. Do I do TV, newspaper, magazine, radio etc? Since we have been in business since 1932, I have a good idea of what to put in an advertisement to make it work. This can be tough in the insurance business because of the state regulations that we have to follow when advertising. After I saw the Deals Via Mail postcard I was impressed with the quality of the product. In addition, I liked the fact that there were so many other respected local business owners on the card that I knew personally. Not only did I see the quality in the product, the price was very reasonable. We started getting qualified leads right away. I was so happy with the results after the first week that I called to make sure I could get on the next edition. I didn’t want another insurance agent taking my spot. In fact, the calls are still coming in three weeks after it was mailed. If you are a business owner who is looking for exposure, but more importantly results, you would be silly not to give this a try. I am a firm believer in “quality” advertising. I’ve always been of the opinion that no one pays attention to the advertisements they receive in the mail, that was why I was hesitant at first advertising on this postcard. Once I saw that I was going to be the only restaurant on the card and none of my competitors were going to be advertising, I decided to try it out. I was mistaken about people not paying attention to things sent in the mail. I was very pleased with the number of people that brought in the coupon. In addition, with the coupon we advertised, (offering a $10 gift card for their next visit) hopefully that will get them to come back and visit us again. I would recommend other businesses advertising on this, with one stipulation – only if they are going to put an offer on it that will make it worth the customers time to bring it in. If the offer is not any good, customers are not going to bring it in and you will waste your money. I received this letter in the mail asking if I want to advertise on this postcard. I had never heard of this company. Although, Bill did offer a guarantee where if I was not happy with the results, the next ad would be free. With this guarantee, I decided to try it out. 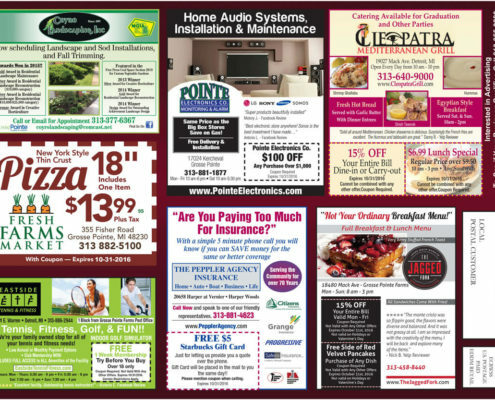 I didn’t think the residents of Grosse Pointe used coupons. I have advertised in the local papers without any success. This proved me wrong. This by far has had the greatest response of any other advertising that I do. I keep all of the coupons in a bag by the register, and the coupons from this postcard are starting to fill the bag. Each time the postcard goes out, I get customers who bring in the coupon. 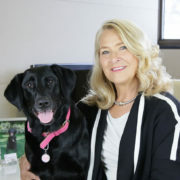 The thing I like the best is that they are new customers who have not been to my business in the past, and I have been open for 35 years. In addition, we have had previous customers who have not added to our 10 year old database. They simply forgot about us. I will continue to advertise on the postcard and would tell any business owner they are making a mistake if they don’t advertise on the card. Even if they have not had success in advertising previously. Before it is to late to secure your spot. Leave a message after the recording. Spaces are limited. Don’t let your competition walk away with your business.